Three giant tortoises, a meerkat and a colony of fruit bats have been killed in a fire at a wildlife centre. The animals, from Gentleshaw Wildlife Centre in Eccleshall, Staffordshire, were in an enclosure that was "well alight" when fire crews arrived shortly after 05:30 GMT. The blaze also affected power cables, cutting off neighbouring properties. 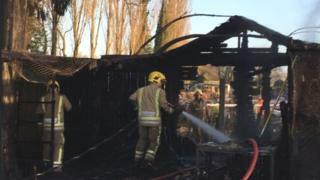 Staffordshire Fire Service said it believed the fire at the small sanctuary had been started by accident. A spokesperson said it was believed to have been caused by faulty heating equipment for the giant tortoises. Jenny Morgan, from the wildlife centre based at Fletchers Garden Centre in Stone Road, said the centre was "devastated". She was visibly upset as she remembered 'Basil' who she described as "the sweetest meerkat". "Sybil, his wife, is okay," she said. "She was more sensible than Basil and ran outside. "The vets have checked her over and she's a bit shook up... Our first priority is her, rebuilding and then finding her a new friend." Firefighters were called by someone who spotted the flames from the main road. Ms Morgan said the centre was "so grateful" to the person who called it in promptly, as left to develop the fire "could have been much worse". The sanctuary is home to more than 30 different species of exotic animals and birds of prey. Ms Morgan said the centre would remain closed today and hoped to reopen on Wednesday.